Workshops at the Florida Herbal Conference take place lakeside in the shade of majestic live oaks draped with Spanish moss. Photo by Ralph Giunta. Florida herbalist Emily Ruff grew a love for plants at an early age. Her father was a botanist, and her grandfather an urban farmer. At age 18, she traveled to Guatemala to work with medicinal herbs and to learn the traditions of what she describes, broadly speaking, as “our herbal ancestors.” Later, she studied under the late George D’Arcy, founder of the Florida School of Holistic Living for which Ruff now serves as director, as well as Rosemary Gladstar at Sage Mountain Herbal Retreat Center in central Vermont. Although she spent nearly a decade as a practicing herbalist in Orlando, traveling to New England or North Carolina, as she put it, “to get my fix of the brother and sisterhood of the green people,” Ruff said she couldn’t help but feel isolated. “The Florida herbal community for a long time was largely disconnected,” she explained. But then Gladstar encouraged her to seek out other Florida herbalists. “I started to poke around in the rocks and gardens and realized that in most of the major communities in Florida there was at least one practicing herbalist,” Ruff said. This realization became the impetus behind the Florida Herbal Conference, now in its third year. Emily Ruff is the director of the Florida School of Holistic Living, which became a nonprofit organization under her leadership, and which organizes the Florida Herbal Conference. Ruff will teach about integrating lunar rhythms into gardening, medicine, and daily ritual. Photo by Caitlin Battersby. The conference will take place February 28 to March 2, 2014 at Camp Winona in De Leon Springs. It is geared toward all levels of interest and experience, with more than 45 workshops including clinical herbalism, herbal crafts, herbal tradition and history, medicine making, edible plant identification walks, and hands-on demonstrations. Many of the workshops’ 30 teachers are based in Florida or have some connection to the state’s plant life, in keeping with the goal of uniting Florida’s plant people. At the same time, the gathering has become an opportunity to showcase the state’s unique flora. A wild food hike at the Florida Herbal Conference. Photo by Ralph Giunta. The conference focuses first on the healing flora of Florida, though approximately 25% of the workshops will center on edible wild foods, Ruff said, pointing out that “the herbal world” is not just about medicine but also balance and how to maintain a relationship with nature—a big part of that being the food that we eat. “For us, wild nutrition is really one of the best preventative medicines out there,” she said. The conference will also include Powerpoint presentations on edible plants by 80-year-old Florida forager and author Peggy Lantz, who has been eating wild plants for more than 50 years and has a new book, Florida’s Edible Wild Plants, coming out in May of 2014 on Seaside Publishing, a subsidiary of the University Press of Florida. Other wild food presenters include Andy Firk from southern Florida, who speaks on medicinals too, and Mycol Stevens (www.floridaearthskills.blogspot.com), who will offer a workshop entitled “Florida Ethnobotany: Botany in the Tradition of Frank Cook.” Ruff herself will present on “Moon Medicine,” offering insights on how integrating lunar rhythms into gardening, medicine, and daily ritual can enhance health and wellbeing while also deepening one’s relationship with plants, planet, and spirit. Guest herbalists David Winston and Susun Weed join the conference for the first time this year to give keynote addresses on Friday and Saturday nights, respectively. Winston will speak on “Herbal Medicine: The Past, Present, and Future,” exploring plant healing through time, including taking a look at the United States’ emergence from what he calls “the herbal dark ages.” He will also discuss the popularity of herbal medicine for allopathic uses (to treat and suppress symptoms), examining the effectiveness of this practice while encouraging participants to take stock of where herbalism is now in order to guide its future development. Susun Weed will present “Herbal Medicine Is People’s Medicine,” a call to action for herbalists to establish themselves as a resource for health, especially now in the context of America’s faltering primary healthcare system. 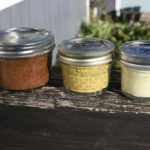 The presentation will include discussion of specific herbs and their uses. Ruff looks forward to bringing the expertise of Winston and Weed, whose “written works have inspired generations of herbalists,” to Florida, which she says is remote enough that it doesn’t always get the best speakers—or bands, for that matter. Both speakers will also offer intensive workshops for an add-on fee. Camping out lakeside. Photo by Ralph Giunta. 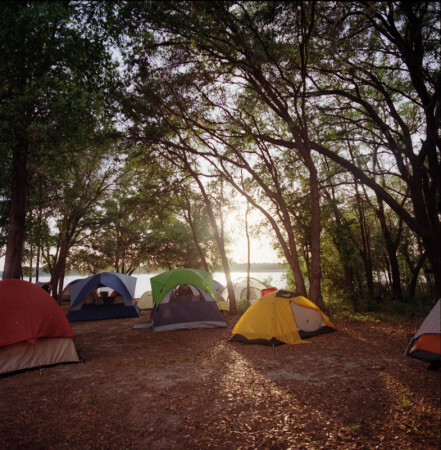 The Florida Herbal Conference takes place lakeside on 100 acres, where participants can camp, rent a bunk in a cabin, or stay in RV’s or trailers. Workshops are spread throughout the long weekend, with five or six taking place at a given time. Recordings will also be available for missed workshops. The event includes a marketplace of herbal vendors, artisans, and crafters; musical activities each evening; herbal activities during free time; morning yoga and guided movement; drumming; a fire circle; henna; singing; canoeing; and regional mixers. A meal plan ticket is available until February 15, and there will be onsite food vendors. The conference is hosted by the Florida School of Holistic Living, a nonprofit organization. Approximately 400 people are expected to attend, and the proceeds benefit United Plant Savers. For details, visit www.floridaherbalconference.org. This piece is excerpted from the December 2013 issue of the Wild Edible Notebook, a monthly publication available for iPad/iPhone in Apple’s Newsstand, or various PDF formats including a screen reader, an Android-friendly PDF, and print-and-fold booklet, for $1.99/month. Visit Wild Edible Notebook for details! This will be my first year attending and I’m really looking forward to it!